Then you repeat that more for an extended period of time. Who knows, maybe I’ll throw in something spontaneous! Anyways, as many people will be relaxing and enjoying the sun and beach, I’ll be getting some serious work done. My motivation for so much work? The rest of my semester would be a smooth ride with little stress. Who doesn’t want a semester with little stress? So, that’s my prelude to spring break. Here is more about what I did this past weekend and week! WEEKEND: Dance Marathon was on Friday. I wasn’t there, but I was definitely supporting my friends who were there! Friday night was nice because I had time to myself, something that rarely happens. I truly enjoyed it. 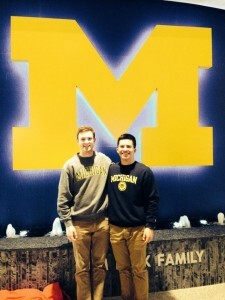 Then on Saturday, one of my best friends Joey and I went to Ann Arbor to watch the University of Michigan Wolverines play the Indiana Hoosiers in Michigan’s last regular season basketball game. Road trips are a blast, especially with awesome friends. This made the drive to Ann Arbor fun and fast. When Joey and I arrived, we ate at Noodles and Company, one of our favorite food joints. Then we walked to the Crisler Arena for the game. Want to know something cool? 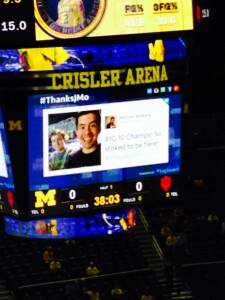 Joey and I tweeted a picture about the game, and it got on the jumbotron! I was SO excited. Here’s a picture of it! 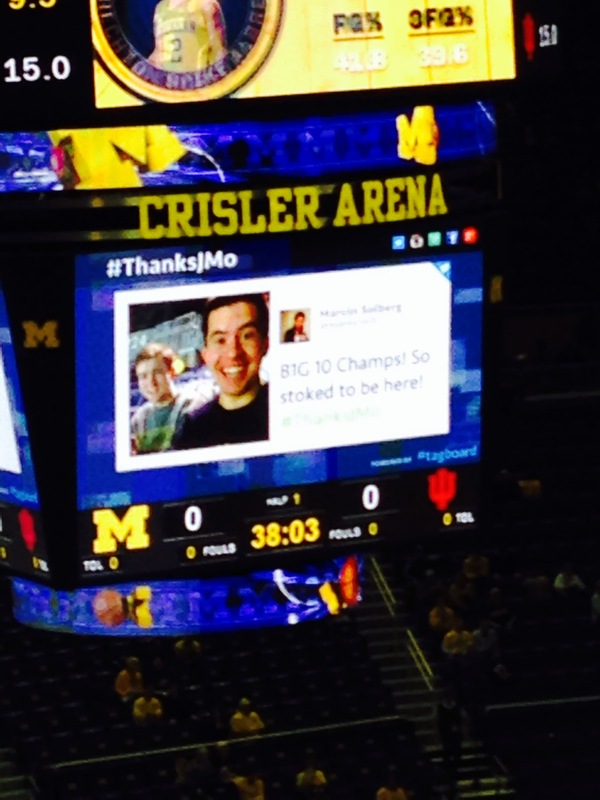 Here we are on the jumbotron. What an honor it was! That was just such a cool experience. The game had so much energy, and it was very close. But in the end, Michigan won! Go Blue! 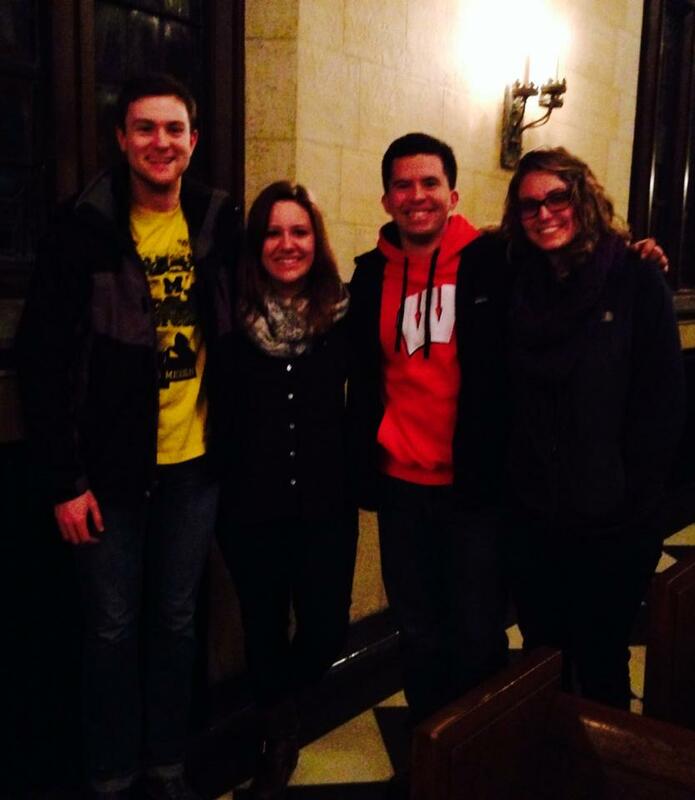 But again, don’t worry, I am an avid Michigan fan, but I am so glad that I go to Hope! My experiences here make me who I am today. 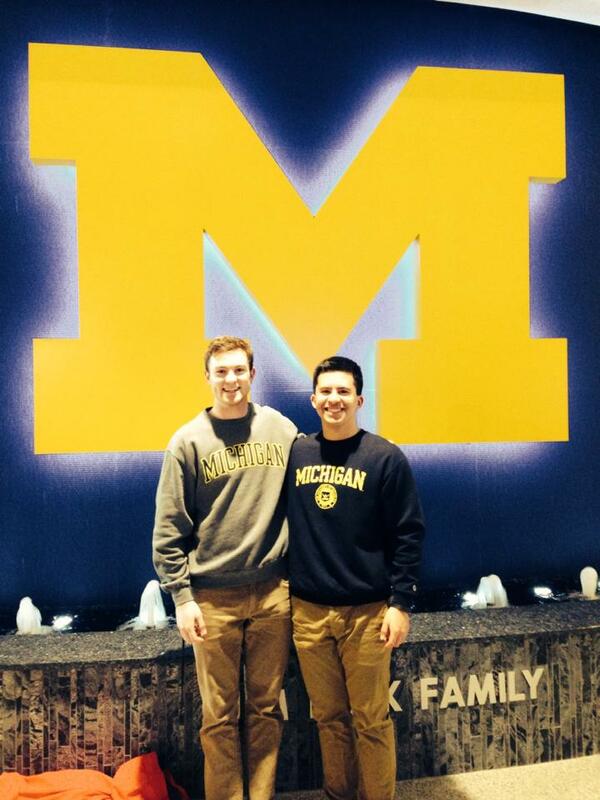 If I went to Michigan, who knows where I would be in life! But Michigan is DEFINITELY my #1 option for grad school. We drove back that night following the game, but before doing so, we hit up another great place to eat; Chipotle. Honestly, I do not understand why Holland does not have a Chipotle. Can we please get a petitioned signed to get one established? Sunday was a sleep-in, catch day on homework. Oh oh oh! And my favorite TV show, Revenge, returned. It was such a great day. To make things even better, my co-leader, Jess, from the immersion trip we lead to Washington D.C. last year visited Holland for the weekend. Obviously, she graduated last year, and now interns for Sojourners in Washington D.C. So cool! What a treat it was to be with her. Although it was super short, it was great to see her and catch up with her for a little bit! Reunited with Jess! (and Erica and Joey of course). To sum up my weekend, it was awesome, A+. Now this past week has been HECTIC. I felt as if everyday lasted one week. Both Monday and Tuesday, I had clinicals and was at Grand Rapids for them. I worked Tuesday night, then I had a large assignment due Thursday. All I did Tuesday and Wednesday night was homework, and by homework, I mean this assignment. Having so much work before any break is annoying, but it feels so good to have it done. It makes the smooth transition to Spring Break much easier! Anyways, thats all on this post. I am in the works of posting another blog that I think you will all like. Stay tuned!!! Previous Previous post: Play Outside!